When protests erupted over the looming threat of deportation faced by Colombian-born high school valedictorian Daniela Pelaez, Florida Senator Marco Rubio didn’t just stand up for her – he met with her personally in Washington. But that doesn’t mean the Tea Party-backed senator has changed his position on the DREAM Act. And they call us racist . . . Too bad Rubio isn't running for POTUS. Last edited by Yac; 03-09-2012 at 04:58 AM..
Like all republicans, they oppose and provide no solution. He is following the party line of doing nothing very well. Senator Rubio has yet to outline what such a reform might look like. Why is it that people in this country uninvited who have the gall to enter this country illegally think that we need to negotiate with them? We already have a solution to illegal immigration. It's called deportation. From the article above: “Instead, my hope is to come up with a bi-partisan solution to this problem. One that does not reward or encourage illegal immigration by granting amnesty, but helps accommodate talented young people like Daniela, who find themselves undocumented through no fault of their own,” Rubio said. Rubio hasn't wandered off the La Raza plantation very far as you can see. He is looking for a compromise and that isn't what the anti-illegal immigration movement is about. I would never vote for him because of that. Last edited by Yac; 03-09-2012 at 04:59 AM.. The Republicans have provided solutions. Your side just doesn't like them. Unfortunately Obama is only deporting illegals that have been "convicted" of a serious crime but has a hands off approach on all the others. No, it's not working well at all. NO amnesty and YES to deportation to ANY illegal alien picked up ARE solutions. That would scare the hell out of the more stubborn ones so they'd shut up. 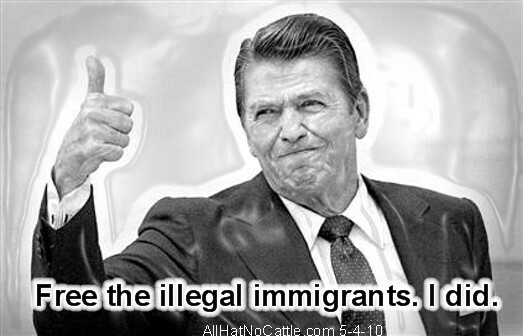 "I believe in the idea of amnesty for those who have put down roots and lived here, even though sometime back they may have entered illegally," Ronald Reagan said in 1984. Why should we reward people who skip the immigration lines? Why the hell should we care if they've been getting away with it for years? What do you believe the solution? Massive amnesty to millions of people who are likely to do nothing but increase taxes on the middle class and compete with the poor for jobs and resources? Why do some people believe that if they want to be an American citizen the first thing they should do is break our immigration laws? That should be an automatic disqualification.